SNARKY sparky Sam Johnston doesn't regret going on The Bachelorette. The 27-year-old Sydneysider was one of four bachelors sent packing by Georgia Love in tonight's dramatic episode of the reality dating show. "It was a good episode and I don't regret anything," Johnston told APN. "It will be a relief to not be on TV any more, but every episode brings back great memories and I get to laugh with my mates." 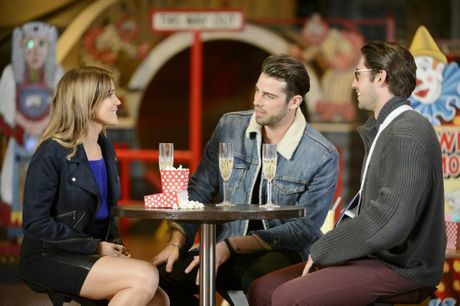 After developing a friendly rivalry with fellow model Rhys Chilton, the two tall, dark and handsome men were selected for a double date with Ms Love at Luna Park. Johnston denies the two men got so competitive there was nearly a punch-up, as had been reported before the episode aired. "I was more happy I got to go on a single date. The fact that Rhys was there didn't bother me," he said. "Nothing like that actually happened. Rhys and I are really good mates." During some one-on-one time with Ms Love, he admitted he was eyeing off more modelling, acting and TV presenting work in the US after signing with a Miami-based modelling agency on a previous trip. "Georgia and I had a chat, which was my one chance to tell the truth and express my feelings and why I was there," he said. "We figured out that we were looking for different things and we came to a mutual agreement that it might not be the right for both of us." He said he was relieved that he didn't have to go through a rose ceremony. "It might look like a bad thing, but I actually preferred leaving on the spot," he said. "Being able to explain yourself to Georgia and she's able to tell you how she feels on the spot and then lets you leave is kind of cool. Those rose ceremonies are tough." Johnston hit back at comparisons between himself and The Bachelor's 'villain' Keira Maguire. "When I watch the show that's definitely me and who I am, but of course there's more than one side to me and I think you only get a glimpse of the cheeky Sam," he said. "I felt like everything I said was more light-hearted. I wasn't so bitchy like Keira. She fought with everyone, she said mean things and really meant them. I said things that I thought were quite humorous." Johnston is yet to start dating again and said he would consider an offer if Channel 10 approached him for the next season of The Bachelor. "If they asked me then I'd put some thought into it," he said. "It (The Bachelorette) was such a big process I think I'm just going to relax and do a bit of traveling for the time being."